While some sources have indicated that production challenges with components for Apple's forthcoming "iPad mini" will limit launch supplies of the device, The Wall Street Journal now reports that many component suppliers are moving ahead to meet Apple's plans to build more than 10 million units of the device during the fourth quarter. Just last week, the publication reported that mass production of the iPad mini had begun ahead of an introduction said to be coming at a media event sometime this month. One recent rumor has claimed that invitations for the media event will be going out this Wednesday, with the event presumably following approximately one week later. You guys are getting heaps of usage out of those mockups, aren't you? I am SO curious what the price of one of these bad boys will be. If not priced competitively - even if a better device, they won't sell as "hot" as a full sized iPad. 2. Some MR members claim "it will never happen." 3. More and more evidence builds that it will. 4. Same people say "it will never happen." 5. Apple sends out invite for keynote. 6. Apple unveils new smaller iPad. 7. People who said it will never happen now say "Apple is doomed." 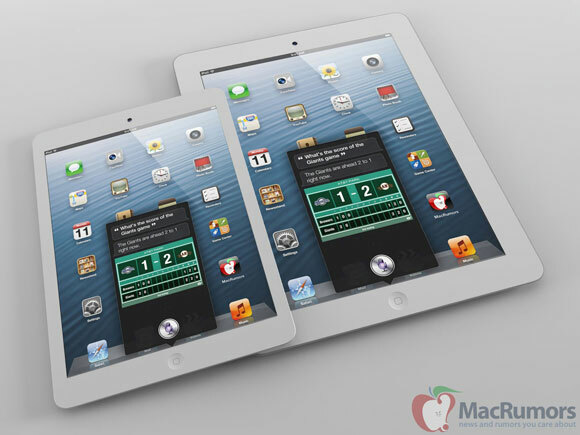 8. iPad mini sells million in the first week and is a success. 9. Those same people keep quiet. I imagine a surprisingly low price for being Apple. If there's something Tim Cook knows his **** about, it's this. :p I'd go as far as to say that the low price will be the main attraction of the mini. I think Apple really wants to kill the lower end in the tablet business, and that they'll try to do it with an agressive pricing strategy to the point of being a device selling with their lowest profit margins yet. They'll have one device precision targeted for this, and they'll try to leave absolutely no room to compete. $199-$250 perhaps? Maybe they are intending to price it aggressively, and that's why they think demand will be strong. However, as well as expanding the iPad market to customers with smaller budgets, it's bound to cannibalise sales of the full size iPad to some extent. Not nessecaraly. Those who cannot afford the New iPad aren't buying the iPad, simply because they cannot afford it. Instead they are resorting to Kindles and the Nexus, cause the price is right, even though they might prefer the iPad. A modestly priced iPad mini around $249 is geared to capture a market that Apple is losing, even though they have the iPad 2 at $399. The fact is those who cannot afford a 399 iPad 2 but can afford a 199 Nexus, will find a way to afford a 249 iPad mini, because it is within reach and worth the ecosystem. Apple knows now more than ever that they have to do this. This is the same with having to get the iPhone on as many carriers as possible, since they were losing tons of sales to loyalty or company discounts with carriers (me for example with Verizon). I wanted an iphone for four generations but I simply would not switch to ATT. When it came to VW, I was up at 2am preording one.